Another post from August, seen in November (I was on vacation when this was posted). I too love rain and the way it changes how we see things. 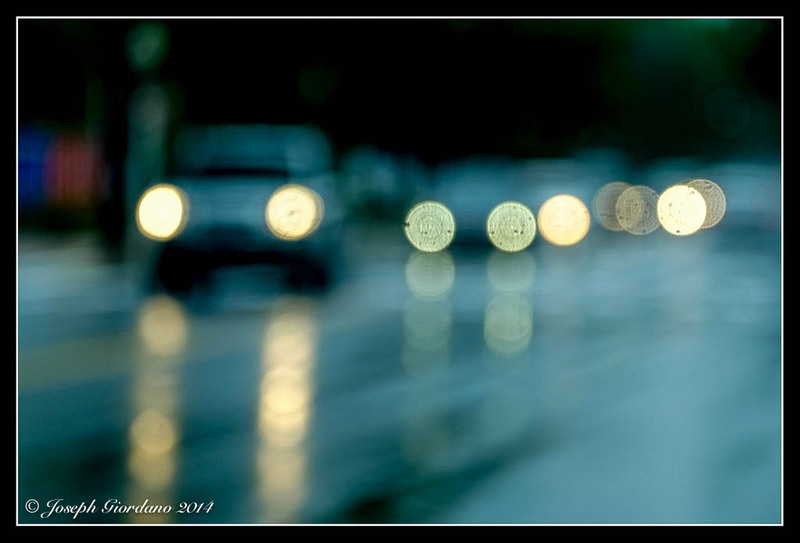 This image has us focus on the lights first and then that great blue color. Love! Admit it! This was taken after one too many Coronas- or is that Mike’s beer of choice? You can not expect to pull off a scam such as this, showing us an out of focus image and calling it art! Well, maybe you can because you did and most people liked it- including me I grudgingly admit. But maybe you should schedule an eye exam before you try this again! It’s just a suggestion. Or you can keep calling it art! Some of us will even agree with you! I really do like the shot. I might even try it out sometime if we ever get rain! But you should know me by now. I can’t seem to say anything nice straight on! I have to sort of slide into it. Don’t know what that shortcoming is but I’m sure there’s a name for it! I really enjoyed looking at this one, Joe. Well done. I love rain regardless if it is related to photography or not. Rain makes the day clean and fresh, just like taking a shower at the end of the day. In Panama we have only two seasons: wet and dry. It’s dry from mid December to mid april, and the rest of the year is wet fun. Rain is excellent to take pictures of puddles which reflect buildings or other stuff. Yep, I love rain. Thats a great way of looking at rain Omar 🙂 Have a great day. Thank you very much Andre 🙂 Have a great day. Wow, that one made me dizzy for a second 😉 Nice photo! HaHa thank you Mary 🙂 Have a great day. Fantastic composition and mood. Congratulations.